neither from here nor from over there. And the mesas crashed onto the freeway like waves. because he’s still cheated of air. The world cheated of him and his corazón, too soon. Jesús was killed on Easter Monday and Tuesday and Wednesday. His heart tan fuerte it took three times to kill him. and the lullabies of the bereft. just how cruel a month can really be. firm and heavy beneath the trees. The dancers dance a prayer. another on my front step. The sky paints itself a heaven. how will She know herself in all her glory? on her cloak by his knowing touch. Her double chin an invocation. Her sorrowful eyes, a lament. Who will paint the Queen of Heaven? Who will kiss the stained hand of her most devoted son? In the park the drums have ceased to call us to the dance. A black dove nests in the arms of my Bird of Paradise. in memory of the one who’s gone. When her twin died Tina lost her bearing. The sisters had never been apart. They slept together like friendly lovers. Cleaned each other’s face and ears, behind the neck. Frida never even had to speak, for Tina heard her thoughts. They played together in their dreams each night, running under the desert sun. Their hair the color of a fawn. Their bellies and feet, precious and pink. Their little hands in little white gloves. Frida made up games for just the two of them. Tina was the athlete. The warrior. The beauty of the family. The sweetness. Indomitable. Frida, the artist. The invalid. The intrepid one. The creative. She worshipped fire. She feared no one. Together they were the Amazon princessas. Inseparable. Invisibly conjoined. So when Frida died, she became Tina’s phantom appendage. The agony of amputation without the blood. And Tina was lost. She wandered from room to room, hoping to find a trace of Frida’s scent. That odor, slightly funky, completely intoxicating. But Frida was gone. She left none of her smell to comfort. None of her kisses. No chaste caresses. The day after Frida died, Tina woke up old. She didn’t want to eat or drink. She refused to use the toilet or bathe. Her eyes, twin oceans of confusion and despair. What was this thing, “alone”? Why did her chest feel as if something had been carved out of it, leaving a bloody crater. No food could comfort. No special treat. No proffered embrace. She still felt her sister’s presence, a vestigial self, missing but so real. She was inconsolate. Sometimes she would look in the mirror, see Frida’s face. Sometimes Frida would visit in dreams filled with happiness and sunshine. In the mornings as Tina began to wake from sleep, the memory of her loss engulfed her. Without volition, a long and low howl would escape from her chest. This new world. So sad and lonely. Less than seven months later, Tina followed Frida into death. They are buried together beneath an altar, a dead tree in situ, its roots still within the earth. A wooden carving of an angel’s face and wings five feet across crowns the stump. On one of the severed limbs sits a brass bowl kept filled with water for the birds who come to bathe and drink and eat the food we leave for them so they will sing to the twins below, a hillock of grass now covering what was nothing but rocks and clay. In the evenings I sing to Baby Tina and Little Frida, whose company I still need by my side, whose love and example of strength and joy I will miss until I die. 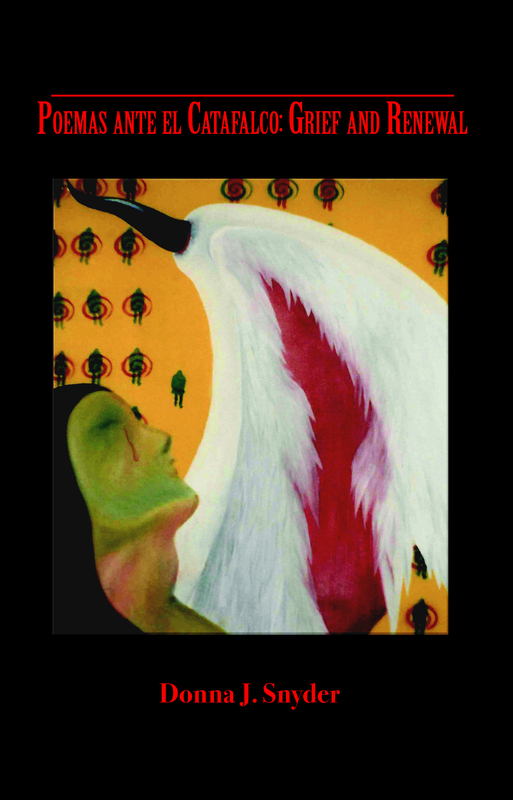 Mary Saracino’s review of my Poemas ante el Catafalco: Grief and Renewal in Return to Mago. 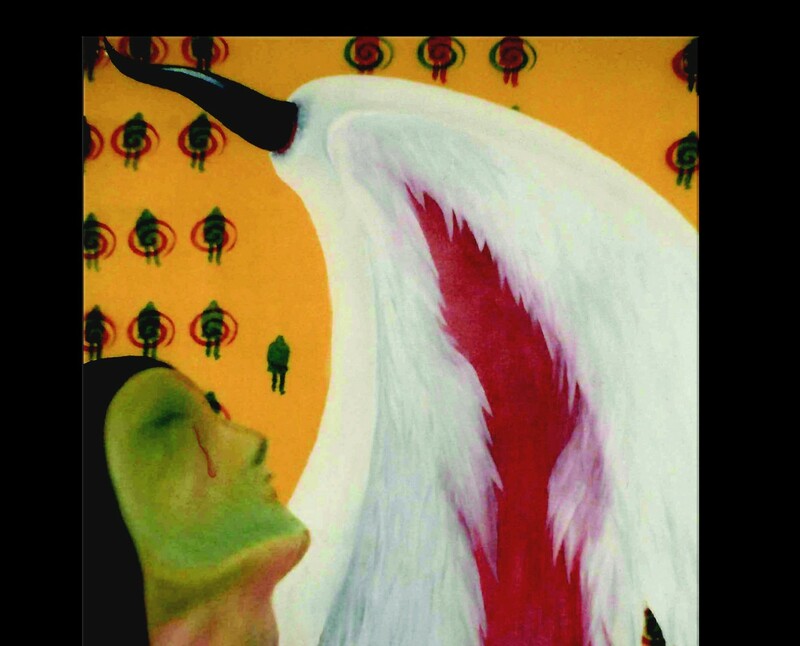 (Book review) Poemas Ante el Catafalco: Grief and Renewal by Donna J. Snyder, reviewed by Mary Saracino. Write me at donnajsnyderpoet@gmail.com for information on how to order, and I can mail you a copy with my inscription.